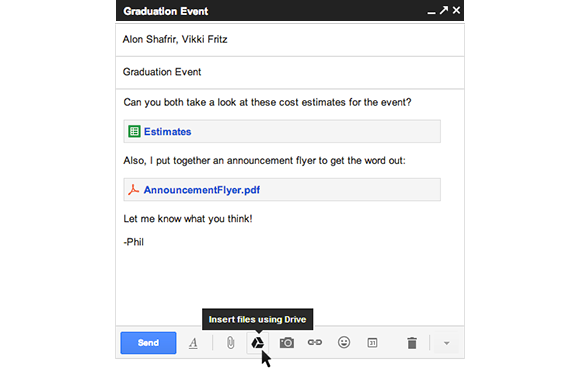 Here is a good news for every Gmail users; yes now you can insert the files from Drive directly into an email without leaving your Gmail. Other good news is now you can send even the larger files upto 10 GB with the help of Google Drive. Formerly, you can send the files upto 25MB through Gmail. But now, you can upload the files upto 10GB this is 400 times larger than what you can send as a traditional attachment. This would be very helpful for special circumstances or important circumstances such as sending wedding photos, or a presentation to your boss etc. Whenever, you are sending a file from Drive it does not shared with everyone, you will be prompted with the option to change the file’s sharing settings without leaving your email. It will even work with Drive links pasted directly into emails. Please keep in mind that, you really are not e.mailing these large files instead Google is just sending a link to your recipients that allow them to grab the files from your Google Drive account. To get started, just click on the Drive icon while you are composing a message. Note that this feature is rolling out over a next few days and is only available with Gmail’s new compose experience, so you will need to opt-in if you haven’t already.